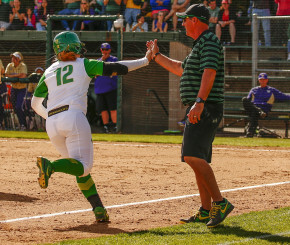 Amid the bright lights of a surprisingly deep NCAA basketball tournament run and the Ducks’ return to the gridiron for spring practice, the impressive run of Oregon’s #2 ranked softball team is going criminally under-reported. The team is 30-4 in the year, 8-1 in conference, and crushing the opposition in nearly every category. The girls in green score almost eight runs a game and allow only three, and half of the team’s 34 games have been victories by five or more. They’re 22-0 when hitting at least one home run, 23-0 when recording fewer than two errors, 28-0 when scoring at least three runs. The team is dominating in every category, and shows no sign of slowing down. UO launched a record breaking eight homers last Sunday alone, on its way to a 15-6 home victory over #19 Washington. The Huskies are one of only three teams, including #1 Florida, to take a game off the Ducks this year, and Oregon still took home a 2-1 series win to remain on top of the conference. This week, two Duck dirt-devils earned all Pac-12 honors: Geri Ann Glasco and Cheridan Hawkins, and they both more than earned it. Glasco was 8-10 on the week with five extra-base hits, an .857 OBP and six RBI through five games. She hit four home runs, a record-tying three of which came in one game, and scored five times herself, good for a staggering 21 bases to 2 retirements on her ten at-bats. On the other side of the ball, Hawkins allowed only two runs through 9.2 innings in the Washington series, an impressive week that will still hurt her mind-blowing 0.43 ERA. 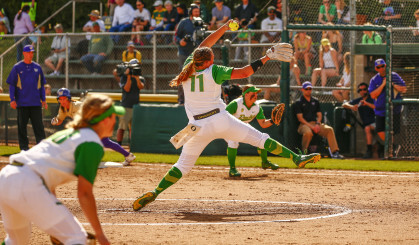 Both runs came on solo shots that did little to counter the Ducks’ offensive outburst in the rubber match of the Washington series, but they may still bother the junior southpaw, whose perception may have been slightly skewed by her 8-0 perfect game on Friday. That five-inning, 56-pitch no-no was the first we’ve seen in Eugene since 2013, but was little more than what fans of this year’s juggernaut squad are beginning to expect, those that are paying attention, at least.